The new USB3 MicroScan is here. MicroVision Medical has introduced real-time assessment and analysis of the patients’ microcirculation at the bed side. Our new USB3 MicroScan can be regarded as the fourth generation handheld microscope for clinical assessment and almost immediate analysis result of the patients’ microcirculation. The Microscan system is a handheld video microscope, that uses the SDF technique to visualise microcirculation in patients at the bed side. Find out more here about its specifications and usage. MicroVision Medical provides nurses and physicians a state-of-the-art hard- and software solution to treat their patients to the best of their abilities. It is looking forward to helping usher in a new era where the microcirculation is a standard parameter used for monitoring and treating the (septic) patient thereby preventing organ failure and death on the intensive care. MicroScan employs a completely redesigned imaging technology called SDF+ as well greatly enhanced data acquisition and analysis algorithms in the latest version of the MicroScan software application called AVA 5. The combination of SDF+ and AVA 5 results in the immediate routine use of the microcirculation as an easily monitored parameter in the clinic. The technology is easy to use, intuitive and fast allowing a nurse to take it on rounds for regular patient checkups. Moreover, it provides reliable, consistent and reproducible data that adheres fully to the rules of the internationally accepted consensus scoring guidelines. MicroVision Medical has a strong focus on high quality imaging, thus allowing for only the best possible images to be presented to the user and the analysis software. Leading the innovations is the age old scientific adagium “garbage in = garbage out”. Therefore the USB3 MicroScan has numerous changes and improvements that allow for superior image quality and highly accurate, reliable and reproducibly image acquisition and analysis. First and foremost the new SDF+ technology allows the red blood cells to be visualised with greater accuracy and detail, which is essential for enhancing the capabilities of the analysis application. The main innovations of SDF+ are a new form of illumination management and resolution enhancement. The USB3 MicroScan has an increased optical resolution resulting in one pixel recording an area of 0.56 μm2 ! It is this level of detail that allows the USB3 MicroScan achieve superior and leading image quality and analysis accuracy. MicroVision Medical has proven that AVA 5 will revolutionise microcirculation monitoring at the bed side. A complete measurement takes less than 5 minutes! This includes the time for an operator to capture images at three sites and the fully automatic analysis. A real time video of AVA 5 can be viewed here. 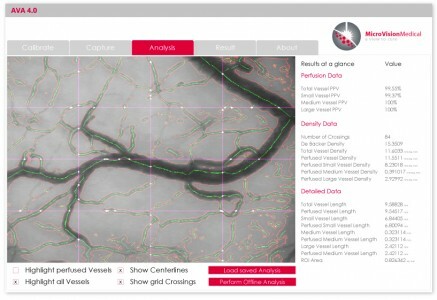 Analysis within seconds, resulting in automatic segmentation of vessel boundaries with centerline and automatic measurement of analysis parameters like – De Backer Score, Proportion of Perfused Vessels, etc. 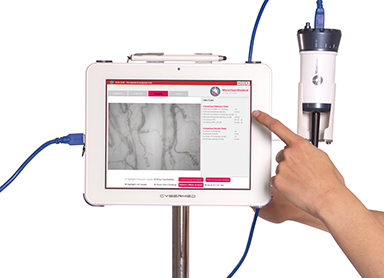 There is currently no other analysis tool available that can fully automatically analyse microcirculatory images. Request a quote for the MicroScan System, sterile disposables and/or AVA software by filling in a simple form. We aim to respond within 1 working day. Here you find the latest articles on microcirculation & the use of the SDF technique. If you are looking for articles in a specific field of interest you can contact us here. The microcirculation as a therapeutic target in the treatment of sepsis and shock. Shock. 2010 Apr;33(4):387-91 || Conclusions: Efforts to improve survival from sepsis are focusing increasingly on intervention during the earliest stages of this disease. The importance of derangements in microvascular flow in patients with established sepsis is well recognized. However, little data are available to describe microvascular changes in early sepsis. After research ethics committee approval, observational data were collected in healthy volunteers and within 6 h of presentation in patients with sepsis and severe sepsis. Sidestream dark-field imaging was used to obtain video images of the sublingual microcirculation. Cardiac index was measured using the noninvasive suprasternal Doppler method. Forty-eight patients and 16 healthy volunteers were recruited. Twenty-eight patients were diagnosed with sepsis and 19 with severe sepsis. Eight patients (17%) did not survive to leave hospital. For small vessels (<20 microm), microvascular flow index (P < 0.05), heterogeneity index (P < 0.05) and the proportion of perfused vessels (P < 0.05) were lower in patients with sepsis and severe sepsis compared with healthy volunteers. Perfused vessel density (P < 0.05) was lower in the severe sepsis group compared with the sepsis group. The proportion of perfused vessels (P < 0.01) and MAP (P < 0.05) were lower in nonsurvivors compared with survivors. Sepsis results in derangements of microvascular flow, which can be identified in the early stages of this disease. These abnormalities are more marked in the most severely ill patients. Further research is required to fully characterize the effects of sepsis on microvascular function. Discordance between microcirculatory alterations and arterial pressure in patients with hemodynamic instability. Microcirculatory blood flow as a tool to select ICU patients eligible for fluid therapy. Is it possible to get a demo of the system? We offer a 14-day demo. The only costs we charge are the shipping of the system and eventual needed disposables. Ask us about the possibilities here. Do you offer device loans for research? In cases where there is a genuine benefit to both parties: researchers and MicroVision Medical. If you think you have a great proposal just contact us here. What is the cost of the MicroScan system? Ask us for a quote via our simple quote form. We aim to answer your quote request within one working day. Get your quote here. Do you have local resellers/distributors? We work with a number of distributors located at strategic places all over the world. Please feel free to contact them directly or contact us if your country is not yet covered by a distributor. We are always open to new collaborations with distributors. Contact us here. If you would like to get an on site training feel free to ask us about the possibilities here. What kind of magnification does the MicroScan System have? 1280 x 960 pixels, at 0.7 micrometer per pixel. What are the technical specifications of the MicroScan System? Do you offer multiple lens tubes with different types of magnification? We can make a special lens with 10x magnification as a special. If this would interest you please contact us here. Can I measure other sites then sublingually? The MicroScan System has been tested, validated and released for sublingual use. When the MicroScan System is in stock we ship within 5 working days. When the MicroScan System is not in stock delivery time is 8-12 weeks. The delivery time after release is 5 working days. The sterile disposable lens caps are shipped within 5 working days. The external surfaces of the MicroScan can be cleaned with only 70% isopropyl alcohol between uses. Other than that, MicroScan System does not require periodical maintenance. How often does Battery Unit require recharging? The analog MicroScan had a Battery Unit. For optimal duration a Battery Unit must be recharged every 2 months. The new USB3 MicroScan doesn’t have a Battery Unit since it is powered by the USB port. A new MicroScan System comes with a standard of 12 months warranty. Additional warranty can be purchased per 12 months. Which scores does AVA 4.x generate? Why does AVA 4.x not include Microvascular flow index (MFI)? Is a demo version of AVA 4.x available? A free demo version of the AVA 4.x research software can de downloaded from our website. Is AVA 4.x compatible with MacOS? Currently AVA 4.x is not compatible with MacOS. We do have this on our software development roadmap, so please return to our website about this in a few months or contact us here. What are the hardware requirements for AVA 4.0? What are the key features of AVA 4.x? Are the disposables one-time use only? For the safety of the patient we advise to use a new sterile cap with every measurement. On all our activities our general sales and conditions apply. You can download them here. Sign up to our Newsletter to receive updates on our products.